Nishimura, born on April 1, 1967 had been interested in film from childhood but a major influence on his career was a painting by Salvador Dalí with distorted human bodies that he saw when in elementary school. He majored in law in college. Nishimura has said that he doesn't watch much television or movies but reads horror magazines and gets much of his inspiration from his dreams. He started making films while in junior high school by teaching himself about filming, lighting, special effects and modeling. In 1995 with a small crew he made the independently produced movie Anatomia Extinction (Genkai jinkō keisū). Nishimura wrote the screenplay, directed, and did the special effects. The film was shown at the Yubari International Fantastic Film Festival in February 1995 where it won a Special Jury Award. The film would later form the basis for Tokyo Gore Police. For several years, Nishimura did special effects and special makeup effects for a number of movies including the controversial thriller from Sion Sono, Suicide Club,and Noboru Iguchi's 2003 comedy-romance-horror A Larva to Love. 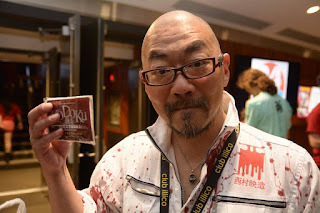 In 2008, he directed his first film, "Tokyo Gore Police". 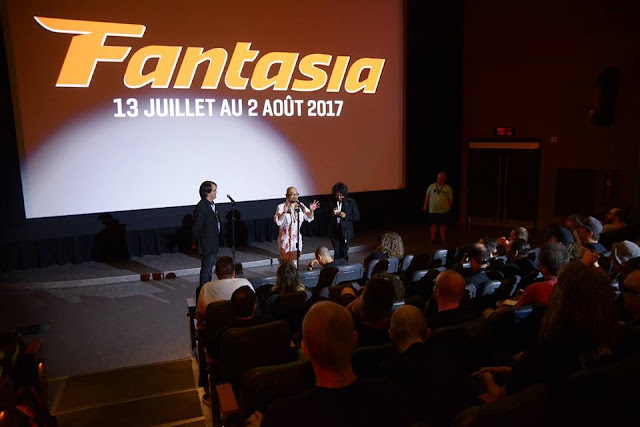 On the occasion of his latest work, "Kodoku Meatball Machine", screening at Fantasia International Film Festival, we speak with him, well, about everything I guess. You have been making movies since you were in junior high and you have worked in quite a lot of films through the years. How difficult is it to make a movie in Japan and do you think that it is easier than in other countries? First of all, making a movie in Japan is pretty challenging. I’ve been making movies in Japan and I can say that both time and budget are very limited. For example, the situation now is getting better but in the past it was so challenging to find all the ingredients for the special effects makeup. Not every ingredient was available in the past, therefore it was a race against time. I haven’t had much chance to make movies outside of Japan, so I can only speak about the cases in Japan. There is no union in this industry in Japan. People work long hours. We do lots of overtime to complete a movie. It is getting normal for me to work like crazy, but I think it is a challenge in Japan. You have majored in law. Have you ever thought about pursuing that kind of a career? My father is a patent attorney. He suggested to me to study law, so I did. I liked social study and history. I liked memorizing. I thought law was a good choice for me and then I majored in law at the university. It was a good choice after all. I never thought of following a law career, however what I studied there still helps my movie making. You have stated in previous interviews that the paintings of Salavador Dali were of your earlier inspirations. Could you elaborate on that? Which ones, for example? “Inu Onna” the poison girl from “Tokyo Gore Police” has no arms nor legs but wears four Japanese swords to fight. This girl is inspired by Dali’s long legged elephant. You have worked in 16 different departments of the production of a movie, from makeup, costume and special effects to actor, writer and director. Which one do you enjoy more and where do you find the time to study and perform all of these? I enjoy every task at every department in making a movie, but I would say directing is my calling. I would say I have no stress working as a director. For other roles or tasks, I would feel frustration due to the gap between what I try to imagine and achieve, and what the director wants to create, and due to disagreements with the other departments. After graduating the university, I worked at a company who creates commercials, for five years. In Japan, in order to create a commercial, you have to work as a director assistant, a producer, an assistant producer, etc, all the tasks at the same time. That’s where I learned all the tasks. I even learned budgeting and working as a producer there. At that point, I had a clear intention of learning everything about movie making and start making movies all by myself alone in 10 years, before I turn 30 years old. So I studied every task I need for a movie production during this five years. After that, I kept learning art work, camera assistance, lightning, etc. I’ve been making independent movies with Sion Sono together for about 30 years. When Sion was 30, he decided to make a commercial film. So it was on-the-job training. It wasn’t easy but that’s how I learned movie making. I learned the business while earning money. You have worked in low budget films as much as in high budget. What are the differences between the two and which do you prefer? Basically, there is no difference between low-budget and big-budget movies. What I do is the same. If there are differences, they are just small ones: more time, better meals, more staff, etc. I like them both. Why did you decide to shoot only splatter movies? What is the appeal you find in the extreme depiction of gore and violence? Actually, I didn’t mean to shoot only splatter movies. I really didn’t realize I was making splatter movies. I’ve been involved in hundreds of splatter movies, creating blood, special effects makeup, monsters, etc in before “Tokyo Gore Police”. I wasn’t always satisfied with the requests I received, but for "Tokyo Gore Police” I could do whatever I wanted, to make it more fun for the audience. Usually the scenes with actors speaking are considered more important than those splatter scenes with blood exploding and special effects, which I had to make them in a hurry. Besides the obvious horror elements in your movies, there is also quite a lot of humor. Do you prefer to scare your audience or to make them laugh? I want to create a “wave” to the audience. I want to show something gross but at the same time I want to make them chuckle. I would like to show something nobody has never seen before. What I create is entertainment. I like them both, making sure the audience doesn’t get bored. I always adjust the audience’s emotion, the “wave”. I call it the margin of audience. You use a lot of blood in your movies but it looks realistic and impressive at the same time. How do you achieve that, even in low budget films? My movies use lots of blood. Sion demands realistic in his movies. He has been a good friend to me and we’ve been making some independent movies together. But I don’t want to make the same movies as Sion, so I go my own way consciously in my movies, showing much more blood. I love his movies and I can make it realistic for his movies. For my movie, I make blood more showy. As a professional I should manage to create both ways. I don’t ponder too much but I use different effects depending on the scene. When more impact required, I use a pump for getting water from a well or a balloon for creating blood splattering. You have repeatedly cooperated with Sion Sono and Tak Sakaguchi. Could you tell us about these experiences? Sion and I have been friends for about 30 years. He has been helping my movies. Tak has been an action actor and a director for action movies and he has been helping me too. Sion also asks Tak for help, therefore these days we three work together. You prefer female main roles in your movies. Why is that and is there an actress that you would like to cooperate with in the future? Is Eihi Shiina your favourite actress to cooperate with? I always had an image that women are strong. I’ve been using women in leading roles. Recently, I started using men. I heard some people want to see some men. This time I use an older man. I don’t always have to use women as a leading role but I prefer a female leading role because I think women can express their strength better. I don’t plan casting for a leading role in advance. The actresses have ups and downs. Some actresses have a long shining career and others don’t. So timing is important. I don’t choose one actress all the time. Not always as a leading role but yes, I do want to work with Eihi Shiina again. I like her but I don’t plan to choose an actress for a leading role in advance. Shiina has ups and downs. She works well on an actual stage but has a strong character. We have to offer her a role only for her, a character that nobody else can do, otherwise she may be lost. Is casting actors-actresses for these films difficult, considering their extreme nature? I don’t have a hard time. I work with new people but since my movie style is very unique, there could be some confusion. So I need to have some familiar faces who know my movies well to pass on some tips for my movies to new actors. So that new actors don’t get drown by the blood. 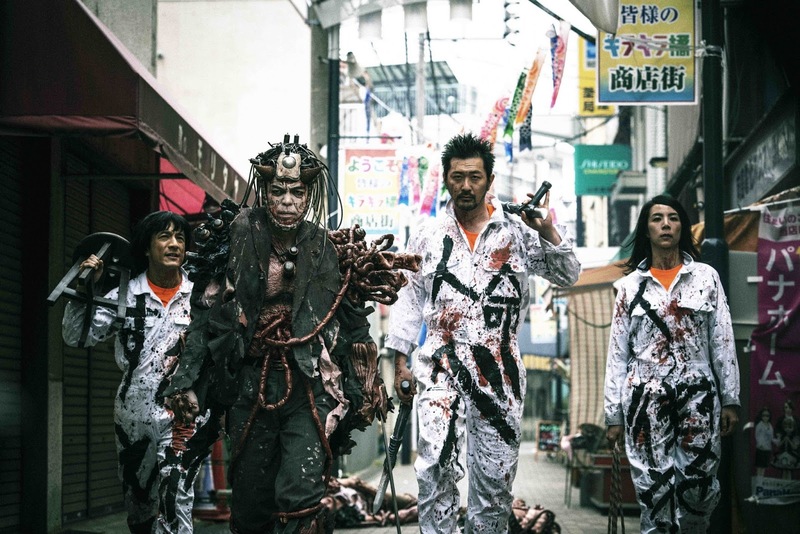 Since "Tokyo Gore Police" you have achieved fame overseas. What are your feelings towards this and what are the differences between Japanese and western audience? I’m happy that more people enjoy “Tokyo Gore Police”. The Japanese audience is very quiet. Too quiet. When overseas, I can feel their reaction right away. I can see what makes them laugh or be surprised. The Japanese audience let me know what was funny a bit later, sometimes after two days later. In this movie, “Kodoku Meatball Machine”, the leading character is a bald old man. Everyone in the movie calls him “bald head”. The Japanese audience laughs In Japan “bald head” is a name-calling but not in overseas. Outside of Japan, it is not something people laugh. “Bald” is considered as a symbol of man and not something people laugh about or pick on. What is the situation with the extreme movies (splatter etc) scene in Japan at the moment? In Japan, the pure love movies with teenagers are more popular. Not much splatter movies are being made. Or the yakuza movies are also popular these days. We don’t have a big audience for splatter movies. Why did you decide to shoot a sequel of Meatball Machine? What was the inspiration behind the script? In general, what inspires you to make movies and how do you work in the scripts? Technically speaking, the very first Meatball Machine was an 8mm movie version as a totally independent movie. And we reworked the first Meatball Machine from the 8mm version, therefore my “Kodoku Meatball Machine” this time is my own creation with the same concept from the original Meatball Machine. So it’s not the sequel. Three years ago, I made an action movie called “Torakage”, a ninja movie. It was a hit. The producer from King Record wanted me to make a movie. I wanted to create “Torakage 2” but he suggested a new Meatball Machine. I wanted to create another Meatball Machine movie so I happily accepted. The producer only requested two things for “Kodoku Meatball Machine”; one request is to use a monster Nekurobogu and the other is to include a love story. That’s all. Other than that, I could do whatever I wanted. For two years I was only involved in making “Shin Gozilla”, no other movie and we lost money. I was shocked to learn that you couldn’t make money even with this popular movie. The theme came from there; working hard forever, but not making money. So the Russian folksong was inspired from this difficult experience. The letters appeared in the bottle was inspired by Twitter. There was such a flame in my Twitter. Every day I got about 2,000 nasty messages from animation fans, therefore I also included the flame to the theme of the movie. All my negative experiences became the theme of this movie. The theme of “Torakage” is family. At the beginning I often used this theme. It is changing now. The way I work is like this; I write a plot in a few pages and then I ponder what I want to say in the movie for a week. Why did you choose family as the theme? Maybe it comes from my problems with my own family. What is your opinion of the movie industry in your country at the moment? Money-making movies are very limited with sloppy love story movies, or someone dying from rare sickness now in Japan. I don’t think they would be popular outside of Japan. There is not much budget for splatter movies in Japan. David Lynch and Alejandro Jodorowsky are my favorite movie directors. I watched many horror and splatter movies such as Romero's. But that’s not what I aim at. I watch them to learn technique, not to enjoy. I plan to go to South Korea and I have two movies to direct. One is about an embalmer.the other one is still confidential. I want to continue to make movies but I also want to teach young people who are in twenties. I’m 50 and I’m not that young.